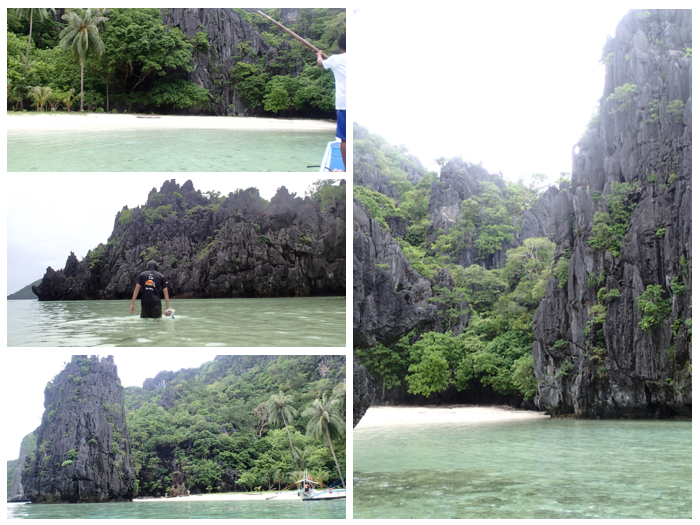 On our 2nd day in El Nido (June 18, 2013), the tour operator told us the weather was improving and that Tour C was available. Horray! 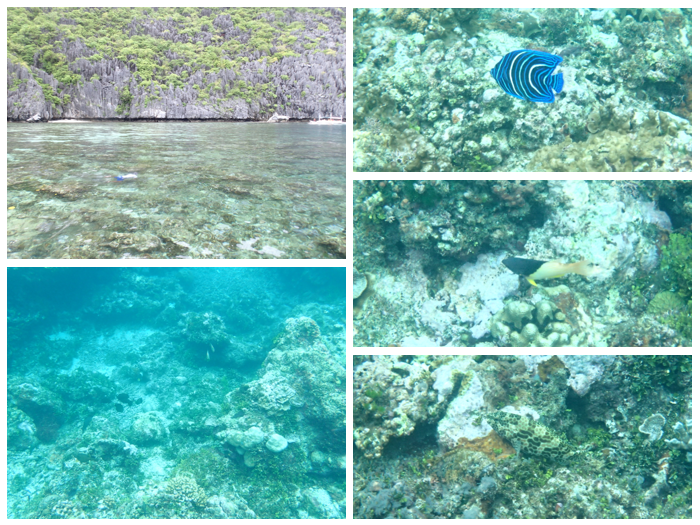 This tour’s main destination is Matinloc Island, roughly 4 kilometers away from El Nido mainland. This is the tour we were most excited about since it’s going to the Secret Beach, rumoured to be the inspiration behind Alex Garland’s The Beach. First stop is the Hidden Beach, not Secret Beach, but Hidden Beach. Entrance to the Hidden Beach. The beach itself was rather small, around 500 meters of white sand surrounded by limestones and forest. It was probably called Hidden Beach because there was a big chunk of limestone in front, maybe 100 meters from the shore, covering the beach from passing boats. The water was also calm in here. The Hidden Beach! 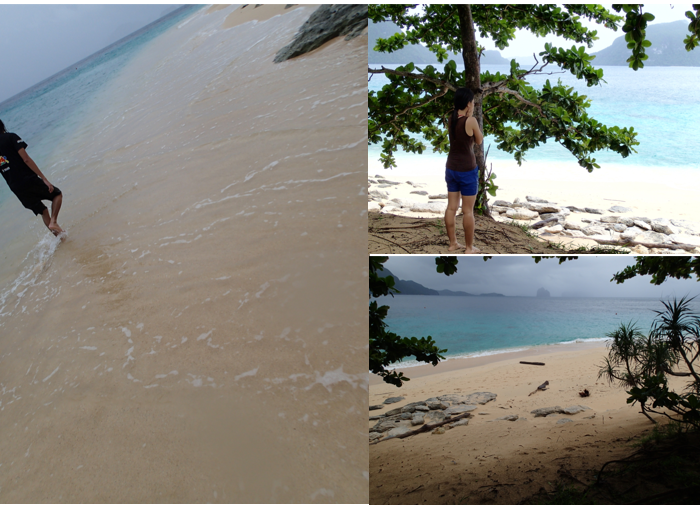 We were the first to arrive, and we had the Hidden Beach to ourselves for a while. On the left end of the beach, there was a tunnel leading to the other side of the limestones. You just have to be careful if you want to pass through because the waves on the other side could slam you to the limestones. The boatmen were busy preparing our food, so we sneeked off into the passage. Yup, we went to the other side, but I held on to the camera and to the rocks and to everything I could possibly hold on to, so I wasn’t able to take any pictures. The waves were a bit crazier in this part, but I saw lots of foreigners swimming around, shouting, drinking, and laughing, so I guess the area was not as dangerous as I thought. 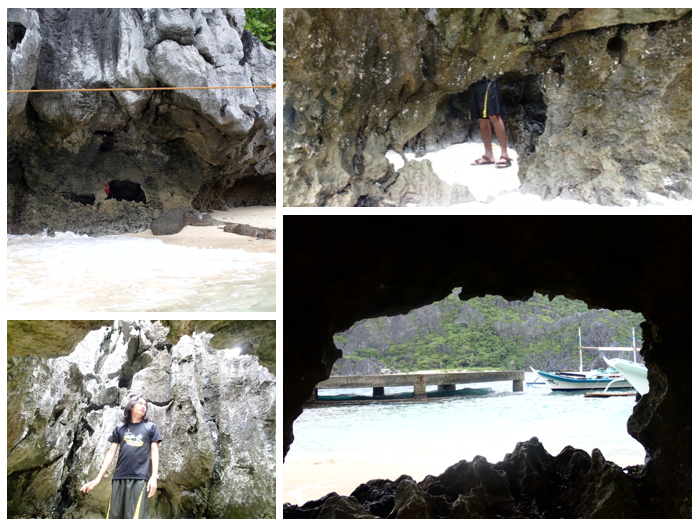 Our tourguide told us that the entrance to the hidden beach was a good snorkeling spot. After telling us to watch for incoming/outgoing boats and to be mindful not to go beyond the limestones and into the stronger waves outside, he went back to his cooking and us to the snorkeling area. One great thing about tour packages, they cook and prepare our lunch on the island! Second destination is the Matinloc Shrine. This place was creepy! It was supposedly a rest house, but was abandoned around the 90’s when the husband and wife separated. The big house was abandoned, the windows broken, the doors open, the stairs full of sands, and the rooms have names of priests on them. Outside the house, there was a small shrine with weathered religious items. Shrine outside the house. I was hesitant to approach this man first, I thought he has been living in this area for quite some time now. It turned out he was just another tour guide waiting for his passengers who went inside the house. Paranoid me! Behind the shrine, there was a small alley leading to the shore. It was the only not-so-scary thing I saw in the area. The small beach was white and the water was clean, although the sea wasn’t as calm as I’d wanted it to be. We didn’t find the Secret Beach, but we did find something! A small chamber in the limestones, 5 average-sized people can fit inside. 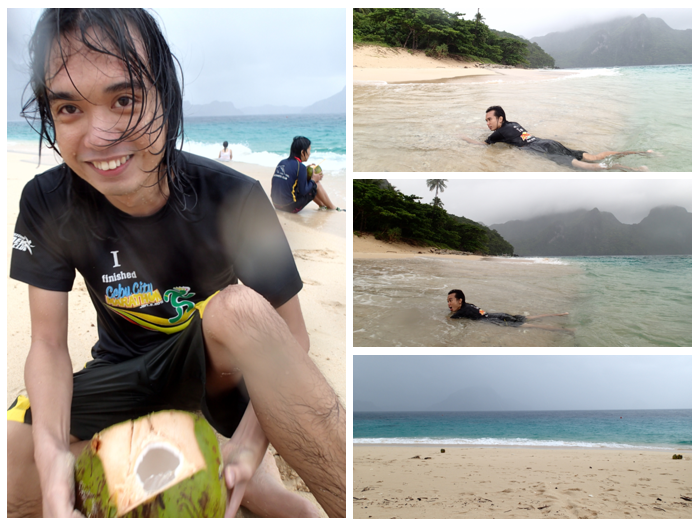 Third destination is the Tapuitan Island. 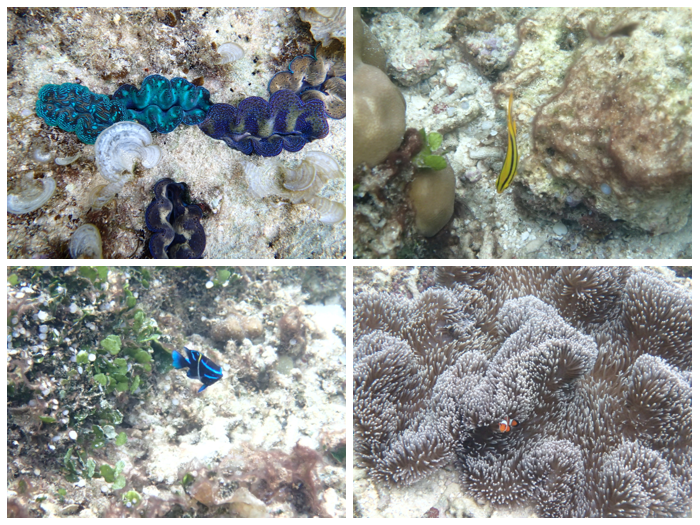 If you love snorkeling, this is the place to be! 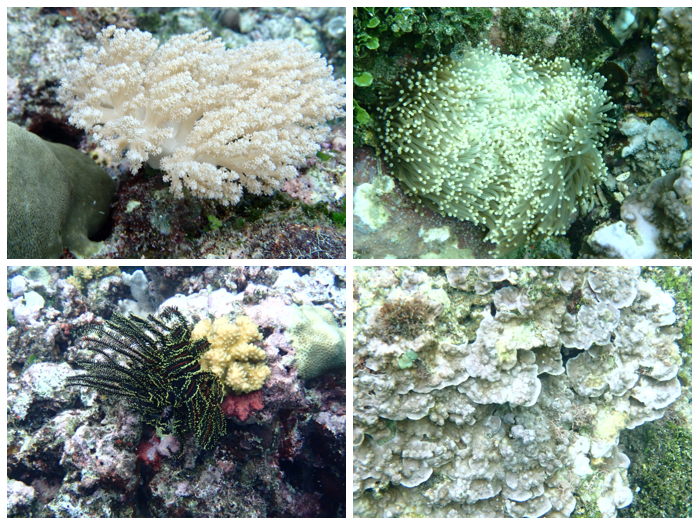 Corals everywhere! And the water is very calm, no strong current. Downside is, tiny jellyfishes everywhere. The blue fish is a Semi-circled angelfish. 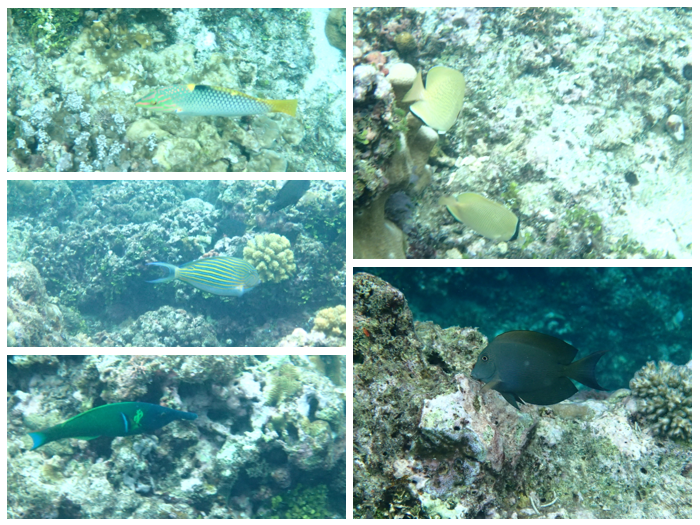 The fish with a blue and yellow stripe is a Striped surgeonfish. Moorish idol – the one with the long dorsal fins. I never got to explore the area completely, I ran out of energy. 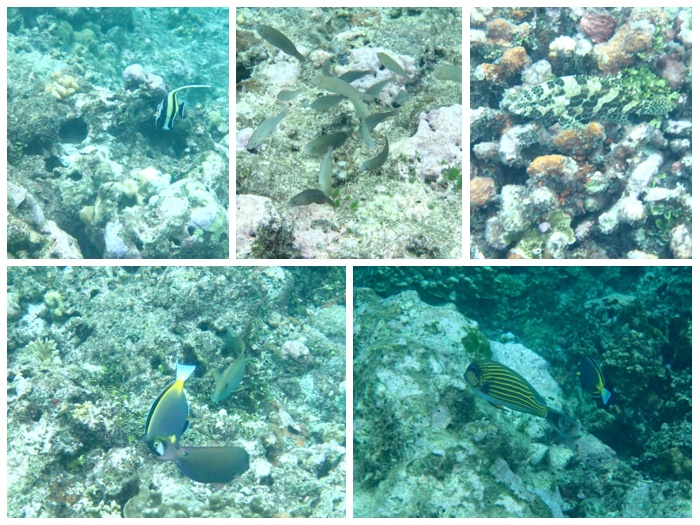 :3 Swimming and diving and chasing pretty fishes, one of the best snorkelling spots I’ve been to! Last, Helicopter Island. By the time we got here, the waves were getting dangerous, plus a strong wind and rain. Helicopter Island, it was obvious why they call it that. While our tour guide were pacifying our scared tour-mates, we descended the boat and enjoyed the waves. When the rain started, that island on the far side became invisible.